In 2014 I watched every single Best Picture Oscar winner in an attempt to find the absolute worst of them. I found it: Crash. Most movies that win Best Picture also win Best Director. In fact, from 1927 to 2014 only 24 movies won the Oscar for Best Director without also winning the Oscar for Best Picture. Did any of those 24 deserve both awards? This is Best Picture vs. Best Director, in which we examine the few films to not win both awards and try to determine why the honors were split those years. Today’s movies are Hamlet (Best Picture) and The Treasure of the Sierra Madre (Best Director), the winners from 1948. Which is the better film? 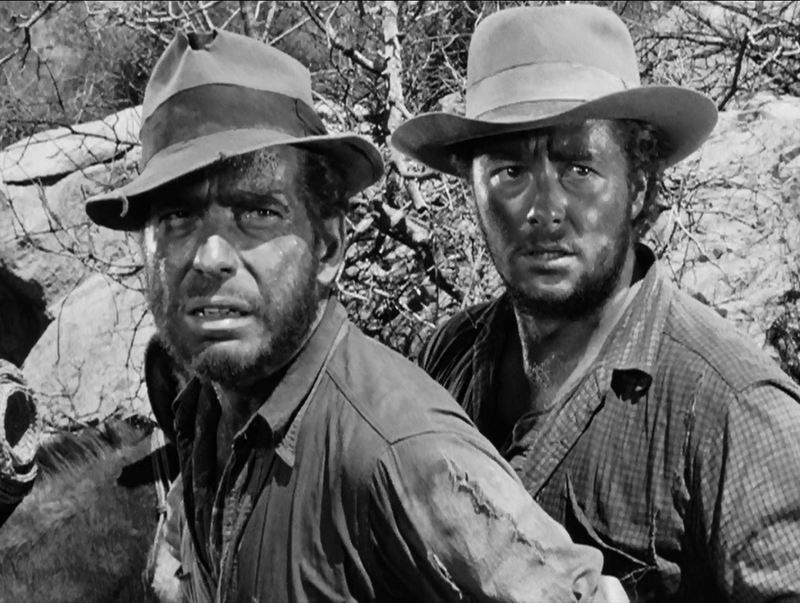 The Best Director film: The Treasure of the Sierra Madre, which everyone knows at least for the “stinking badges” line (which isn’t actually exactly that, but you probably know that, too). It’s so much more than a memorable line. One of the best films on either of these lists, Sierra Madre is a serious look at men who feel the world owes them more than what they’ve got. Fred C. Dobbs (Humphrey Bogart) teams up with two other men (Tim Holt and Walter Huston, the director’s father) to search for gold in the mountains of Mexico. They luck out after relatively few setbacks and are rewarded with small personal fortunes. It’s enough to split three ways, but that logic only holds up until it’s dark out and you’re alone with your thoughts. Do you really have to split it? Don’t you deserve it all? How well do you really know these other guys, anyway? The Best Director director: John Huston, who was nominated for the award four more times. The Treasure of the Sierra Madre was his only win. Like seemingly every other great director on the list, he was married a number of times (five) and has famous offspring (Anjelica Huston). His name may not be one you immediately know like some others on this list, but he fits right in with the other drinking, smoking madmen who made great art in the 40s and 50s. The Best Picture film: Hamlet (read the Worst Best Picture entry here), which I ranked 81st on my list of every Best Picture winner. I was pretty brutal to Laurence Olivier’s Hamlet in my first viewing, largely because I disagreed with the choice to play up Hamlet’s sexual feelings towards his mother. It might benefit from a rewatch, but I can’t imagine sitting through three more hours of those two actors inches from each other’s faces. The Best Picture director: Laurence Olivier, who directed only a handful of movies despite being one of the greatest actors of all time. I recently watched the insane The Boys from Brazil and he nearly saved even that disaster. He was marvelous in Hitchcock’s Best Picture winner Rebecca. He was an iconic Shakespearean actor, but he seemed to only want to direct a few works. I haven’t seen his Henry V or Richard III, so as a director I can only judge his Hamlet. I judge it harshly, but more for the directing choices than for his performance, which is exactly what you’d expect from an actor of his stature. Did the right movie win Best Picture? No, though I’m harder on Hamlet than the average viewer. I don’t like the interpretation of the play and that distorts my ability to judge any other part of the film, but it’s a lesser piece of art than Huston’s adaptation. I haven’t read the original The Treasure of the Sierra Madre, but I have to imagine it’s closer to the film than Hamlet. There are comparisons to be made beyond that, but the most important thing to comment on here is how impressive Bogart is. He’s one of the greats for a reason, and he plays Dobbs with such darkness right from the start that it fills the viewer with unease. His portrayal sells the message of the whole picture, and I think that, on top of so much else, deserves the nod. Just for the hell of it, are either of them worse than Crash? Nope. Hamlet is harder to sit through and it’s certainly less interesting, but the “interest” when you’re talking about Crash is morbid curiosity. I still think about that scene in Crash where a guy almost kills a kid in the street in broad daylight and then no one does anything about it. I think about that scene a lot.